Well, folks, it's almost that time of year again, when half your twitter stream and facebook wall are beset by writing sprints, word wars, and productivity pep talks. It's time for NaNoWriMo. For those of you wondering what in blazes I'm talking about, that strange looking acronym up there stands for National Novel Writing Month. Every November, the gears at the NaNoWriMo website begin turning anew, and an eager community of writers wake from their virtual slumber and spring to life around it. The aim is to write a manuscript of at least fifty thousand words in the space of thirty days, and the community is chock full of encouragement and empowerment, pushing each other toward that goal. And for the first time in two years, Yours Truly will be taking part. "Now, hold on right there," I can hear you saying already. "Aren't you writing short stories these days?" Alas, I must raise my hands in acquiescence. The jig is up. You've caught me. This year, I'm strolling right up to the gates of NaNoWriMo, kicking them in, and laying my cards on the table. Alden's not playing by the rules this time! Okay, I'll stop with the cheese. You see, I'm still going to be aiming for that fifty thousand word goal, but I'm not going to be writing a novel. I'm sticking with my shorts, hoping to knock out as many first drafts in one month as humanly possible. This isn't without precedent for the NaNoWriMo community. In fact, a whole section of their forums has been conceded to the NaNo Rebels, who march to the beat of their own drum, guidelines be damned. Of course, we rebels aren't without our detractors. There are those who would condemn the likes of me, looking down on us as rule breakers. I've even heard a story or two of people new and unfamiliar with the community being told by some that they can't participate if they aren't working on a novel. This is, of course, ridiculous. The whole point of NaNoWriMo (besides making literary agents dread the month of December with every fiber of their being) is that you get out of it what you put in. It's about setting a lofty goal and striving for it with all you've got, with the help and encouragement of a like-minded community. The idea that anyone should be excluded from that experience because they aren't doing exactly what you are is an affront to the spirit of the event, and the organizers have stated this repeatedly (and it's why they gave the NaNo Rebels their own stomping ground on the site in the first place). So, if you've been peeking at participants out of the corner of your eye every time November rolls around, hesitant to leap in and give it a shot yourself because you don't think what you're writing qualifies, consider becoming a rebel. At its heart, NaNoWriMo is about personal achievement, and you should never give yourself an excuse not to achieve something. Me, I'll be giving it my best go. I'll be honest with you—the last time I participated, I failed. I fell short of my goal and denied myself a victory lap. This time, things will be different. There's a variety of reasons for my new found confidence, not the least of which is the fact that I have a monumentally more flexible writing schedule now, but chiefly it's because my attitude is different. I consider myself a professional, and I intend to work like one. Fifty thousand words in a month? Piece of cake. Let's do this. The rebellion begins in three days. Who's coming with me? My NaNo username is AuthorAlden. It's only 1667 words a day. It's doable in theory. I only got to 20 or 25K last year. If you're doing it, you should do it to accomplish your goals, not someone elses. I plan on sticking to a 5 day work week (depending on how things go), so it's going to be around 2400 words a day for me until I break down and start working on weekends. That's still doable as long as I keep my schedule strict and pry off the backspace key. Thanks for the comment, Tonja! I think any method of pushing yourself beyond your limits and writing consistently is great, whether you call it NaNo or not, whether you stick to someone else's guidelines or go at your own pace. There's nothing more energizing than working to be better than before and seeing the results. Even determination alone can give you a tremendous boost. I'll be writing a damn lot this November too, though I'm not registering anywhere official. I'm revising my novel, and for me that means I'm rewriting every scene I'm not satisfied with (so practically most of them). I love it, to be honest, there's not the faintest drop in enthusiasm, quite the opposite. And practice has considerably increased my wordcount and my confidence. It's really all a matter of practice. You're absolutely right, Vero. NaNo looks to kick everyone in the pants and get them writing, but what it's actually doing is showing people what they can do when they commit to hard work and a productive schedule. I think the best way to leave NaNo is not just with a sense of satisfaction, but determination, bringing those habits on into the month of December and the next year round. There's nothing special about November, after all. If you can do it then, there's no reason you can't do it anytime you want! Thanks for the encouragement, Vero! 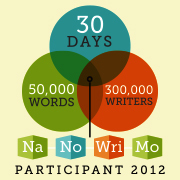 Wahoo, NaNoWriMo Rebel! You go!I love your idea of hammering our a bunch of short stories instead of an entire novel. It's a great idea and I wish you lots of luck! I'm not doing NaNo myself this year as I'm in the final editing / writing stages of my current WIP, but I look forward to reading your updates! I'm excited to get going and get these stories written. Good luck with your WiP, Camille, and thanks for the encouraging words! Thanks, Randi! What I love about going the short story route is if I get hung up on something (often a death nail in NaNo), I can just switch to a different story and come back to it later on, or even hold it off until December if I need to. Good luck feeding that bunny! Failed? Nah. Did you write a lot? Did you get yourself in the habit of writing? Then you succeeded. With astounding success. From one NaNoWriMo rebel to another, it's not about meeting someone else's arbitrary 50K guideline. There are several days a week I just don't have time for 17K (or even 16K, rounding-downers). It's about writing. Writing a lot. So if you do a lot of writing, you've won. That's definitely the way to look at it, Juturna. Whether you "failed" or not, you still get a nice prize at the end: all of those words you managed to get down on paper, and hopefully the good habits that will carry on long past November. Good luck, if you're participating this year. Either way, thanks for the kind words! 50,000 words is 50,000 words, no matter what the format. I'm editing next month so no NaNo this year. That's my frame of mind, exactly. Thanks, Alex! No problem, Lauren. I think the biggest problem for agents are those participants who start querying right away in the excitement that they've written a "novel" in just thirty days. But those first fifty thousand words are only the beginning! Good luck in your first year! I'll be right there on the battle field with you. Good luck, man. This is a great idea! I don't see anything wrong with bending the rules - you'll still be writing 50,000 or more words in November (hopefully :) ) and striving to meet a big goal - that's what's important! Will your short stories connect in some way? Maybe all take place in the same world or follow a group of characters whose stories are connected? I have no plan to connect the stories in any way, thus far, but I've intentionally done no planning leading in, as I want to see what my brain produces during a month long blitz with no real prep before hand. So, I suppose anything's possible! The first story seems to be a good one, though I'm having trouble shushing my inner editor. Thanks for the comment, A.K.! Maybe they'll end up connecting anyways :) Sometimes the brain does things like that in the background when you're not paying attention. Glad the first story is already well under way! I like your style. The spirit of NaNo seems to be one of 'why not?' more than anything related to rules... You just gotta jump in with both feet. Best of luck to you. I hope you spend the entire month thrilled with what you get to write tomorrow, because isn't that the point? You hit the nail right on the head, Chloe. It's all about turning off the filter and pushing yourself ahead. I'm already writing something very different then my usual fare, so it's producing interesting results. Good luck! I did a Camp Nanowrimo rebel session of short stories last June, that was a lot of fun! I got eight stories finished, though it was kinda crazy at the end there. Glad to hear it worked out for you in the end! I'm hoping to start out strong so there's not as much pressure to crunch toward the end of the month. Thus far, it's working but we'll see what happens when we get to the middle of the month, where the danger of losing steam is most prevalent.